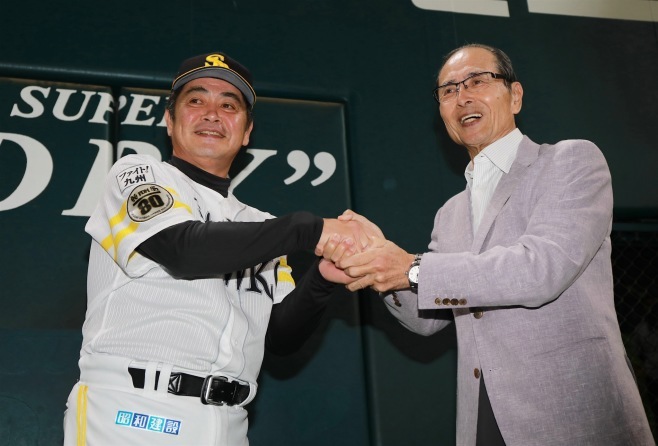 It was hardly a surprise to learn today that SoftBank Hawks manager Kimiyasu Kudo was named the winner of the Matsutaro Shoriki Award, which is intended to honor the greatest contributor to Japanese pro baseball. In a season when no players really captured the nation’s attention, the selection committee, comprised of Hall of Famers Sadaharu Oh, Shigeru Sugishita, Futoshi Nakanishi and Koji Yamamoto, and journalist Ryusho Kadota, settled on the usual suspect, the winning manager of the Japan Series. Attending the Shoriki Award press conference for the first time, I was surprised with how interesting the discussion of the various candidates was. I figured, since the selections are fairly predictable, that the explanations for the decision would be bland and predictable, too. In one sense that was true, but in other ways it seemed a bit more open-minded than I expected. Like its brother award, the Eiji Sawamura Award for Japan’s most impressive starting pitcher, the Shoriki Award is sponsored by the Yomiuri Shimbun and is decided by a small panel. Ogata has won three straight Central League pennants and was credited by Oh and Yamamoto with turning the Carp franchise around, and by Sugishita for overseeing a rapid development of the team’s young talent. Yamada this year had his third career “triple three” season, the Japanese expression for a season in which a hitter has 30 or more homers and steals, while batting .300-plus. Nakanishi indicated that Tsuji deserved similar credit for the Lions winning the Pacific League for the first time in 10 years. But in the end, it came down to the big question, what did you do in the postseason, what color was your championship flag. Oh spoke at some length about Ogata’s accomplishment, but added that the Carp were poised to win again, so better luck to them next year. The same for Yamada, saying, it’s not only about individual achievements, and that he would have been a super candidate had the Swallows won either the league or the Japan Series. Kudo yanked his faltering starters out of the rotation and made them useful in middle relief. They thought highly of his creativity in the Japan Series, using two-time batting champ Seiichi Uchikawa to bunt in Games 5 and 6, running aggressively despite possessing a power-laden lineup and having a proactive approach with his bullpen. Being patient with reliever Yuito Mori, when he inherited the closer role following a season-ending injury to Dennis Sarfate. Notes: Kudo has now won three times, once as a player, twice as a manger. Oh, who was the first recipient after surpassing Hank Aaron’s career home run total in 1977, and has won three other times, twice as Hawks manager and once for winning the World Baseball Classic in 2006. 2003, when beaten Japan Series skipper Senichi Hoshino was named co-winner. 2006, when Oh won instead of Japan Series-winning skipper Trey Hillman. 2012, when Giants catcher Shinnosuke Abe was named co-winner with Hara. The run of automatic wins for Japan Series managers—which started in 2001, when Tuffy Rhodes hit 55 home runs to tie Oh’s 37-year-old single-season home run record and led the Kintetsu Buffaloes to the Pacific League pennant—ended last year when Sarfate was named the winner after setting NPB’s single-season save record and finished with a dramatic Japan Series effort. This got really silly in 2016, when Shohei Ohtani grabbed the baseball world’s attention with his second “Babe Ruth” season of 10 wins and 10 home runs. That year Nippon Ham Fighters manager Hideki Kuriyama won 1) because the Fighters won the Japan Series and 2) because he did such a great job developing Ohtani. I wasn’t at that press conference, but his starting-pitching management was noteworthy, and I’m sure he got credit for that. Had Ohtani been a force in the Japan Series, he probably would have won, but instead became a reason his skipper was the winner.